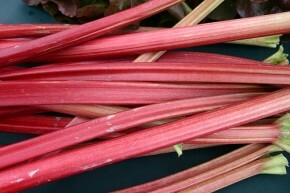 Rhubarb, that harbinger of spring… or for those of us living in Alaska, of summer! We’re thrilled to see it poking up out of the ground! I know, these little crinkled leaves don’t look like much, but once they get going, the stalks really shoot up! Since not very many types of fruit grow in Alaska (and strawberries and raspberries are still a long way off), we’re happy for any fruit-like substance that can eke out an existence in our backyards. We’re even more excited than usual, because of the unusually warm and sunny weather we’ve had these last several days. Everyone I know has gone stark-raving mad, capering about in the sunshine and soaking up the rays as much as ever they can. I think we’ve gotten more sun this past week than most of us got in all of last year’s cold and rainy summer. Oh, does it feel good! But rhubarb popping up in the garden does come with a certain sobering responsibility. Suddenly, I remember that I have several bags of sliced rhubarb in the freezer from last summer. And if I don’t use it up now, before the next crop comes in, I’ll be even more overwhelmed with rhubarb than usual. My rhubarb plants are divisions of my mom’s, planted over thirty years ago. I have no idea where they came from, but they are wonderful, with fat, tender, cherry-red stalks that produce all summer long (if I make sure to break off the flower stalks as they come up). If I’m not diligent about cooking and eating rhubarb and processing it to freeze, the plants are likely to overwhelm the entire front of my house. So! We’ve been eating rhubarb crisp, apple-rhubarb crisp, rhubarb coffee cake, and rhubarb-apple pie. Here’s my recipe for rhubarb crisp, in case you still have some in your freezer from last year… and a variation with apples that I like even better. But if your house is in danger from being overtaken by a rhubarb plant, I recommend the former recipe. It uses more rhubarb. When the rhubarb is coming on strong, it’s time to take decisive action. This recipe is based on one from Deborah Madison’s Vegetarian Cooking for Everyone. 1. Preheat the oven to 375 degrees. Make the topping and set it aside. 2. Combine the rhubarb with the sugar, flour, and spices. Coat a large gratin dish with oil or non-stick spray. Pour the fruit into the dish. 4. An hour or two before you’re ready to eat the crisp, sprinkle the topping evenly over the fruit. Return to the oven and bake for 25-30 more minutes, or until the juices from the fruit are bubbling and the topping is brown. Serve hot or warm. 1. Preheat the oven to 375 degrees. Make the topping and set it aside. Dice the apples, then put them in a bowl and toss with the remaining ingredients. Pour the fruit into a 2-quart gratin dish. 2. Bake, uncovered (without the topping), for 30 minutes. Remove from the oven. 3. An hour before you’re ready to eat the crisp, sprinkle the topping evenly over the fruit. Return to the oven and bake for 25-30 more minutes, or until the juices from the fruit are bubbling and the topping is brown. Serve hot or warm. This recipe makes enough for 1 heavily-topped crisp, or 2 lightly-topped crisps. Make this recipe, and if you like a light topping, use half and freeze the rest until you want to make another crisp. Or use the whole amount of topping on one crisp. Another note: the Loriva walnut oil is really fantastic; it’s roasty and toasty-tasting and very rich. Don’t bother using refined walnut oil, because it doesn’t have much flavor and the recipe won’t be nearly as tasty. Use butter, instead. If you don’t want to use walnuts, replace the nuts with an additional ½ cup of rolled oats. Combine all ingredients so you have a crumbly, moist mixture. This time of year, we all have so many traditional sweet treats to make—for our friends, family, and ourselves! I remember making lots of special holiday cookies with my mom when I was little. Some that come to mind are the spritz butter cookies that I loved to squirt out of the press in green wreath shapes and decorate with red hot candies, the krumkake that we made in a special waffle iron and then rolled around a wooden cone, and the peppermint-flavored dough that we rolled into pink and white snakes and then twisted into candy-cane shapes. For a few years, my mom even made rosette cookies, with the heavy iron molds she dipped into the cookie batter and then deep-fried in her electric wok. Remember those? Dusted with powdered sugar, they left a grease slick on the roof of my mouth… With all those fond memories, plus plenty more of my own favorite cookie recipes, it’s pretty easy to think of holiday treats and cookies to make with my four-year-old, Meredith. I’m sure it’s the same for you. But why do we only think about including our kids when we’re making treats and sweet things? I didn’t learn how to cook until I went to college—my mom didn’t think to include us kids when making dinner—I think she just wanted to get dinner on the table, and didn’t need us underfoot. So in the interest of teaching Meredith to cook healthy, delicious meals (not just desserts), I try to include her in all sorts of cooking projects. She’s not always quite as interested in making a salad as making treats like graham crackers (eating raw dough is one of her favorite hobbies), but there is almost always a fun part in even the most ordinary meal. If I’m not rushing to finish lunch or dinner, I’ll ask if she’s interested in helping. And usually she is—for a little while, anyway! My greatest inspiration for Meredith-inclusive cookery is my friend Cate, who writes a fabulous blog about cooking with kids: Tribeca Yummy Mummy. She is all about including our kids in cooking real food—using real, raw ingredients, and making meals and FOOD, not just treats. Thank you, Cate, for encouraging us to raise our expectations of what we assume our kids are interested in, and are capable of doing in the kitchen! The dressing is really fun, too—it’s just pureed pears with some pear vinegar and a little olive oil and salt. SO tasty, though, and it’ll keep for a couple of days in your refrigerator if you have leftovers. I’ve found a couple of different brands of pear vinegar in grocery stores and specialty stores in town, but if you can’t find any, you can substitute 4 tablespoons of apple cider vinegar and 2 tablespoons apple juice. Place the pear in a blender with the vinegar and salt; puree it until smooth. Drizzle in the oil while the blender is running. Taste for salt and sweetness. If your pears weren’t very sweet, you might want to add a little sugar to the dressing, or you can add more olive oil to tame the vinegar’s sharpness. Refrigerate until ready to serve the salad. 1. Wash and dry the greens and make the dressing. 2. When you’re ready to serve the salad, cut the pear(s) in half, cut the core away, and slice thinly. 3. Put the greens and fennel into a bowl and toss them with dressing to your taste, then add the pears and toss gently. Arrange on individual plates, and if pomegranates are in season, top with their seeds. In honor of those giant heads of lettuce, that somehow do overcome the encroaching weeds, I’m sharing a recipe for our favorite salad that we love to eat all summer. You can use different fruits throughout the summer, but the funny thing about strawberries here in Alaska is that we can get great ones even into September if the weather has been cool like this summer! You can substitute ripe peaches for the strawberries, or ripe pears in the fall; in that case, top with toasted almonds and omit the mint. It’s wonderful, too! This recipe is a variation on a recipe in Audrey Alsterberg and Wanda Urbanowicz’s Rebar: Modern Food Cookbook . If you’re skeptical about putting fruit in a dinner salad, this recipe will change your mind. If you can get really sweet, fragrant strawberries, there is no reason to eat anything other than this salad until the strawberries run out. If you want to serve this salad with something else, try it with any kind of a sandwich or toast with a topping. I tend to like eating so much of this salad for dinner that a nice fat slice of whole grain sourdough toast drizzled with olive oil is all I really need. Whisk all the dressing ingredients together, except the oil. Slowly drizzle in the oil while whisking. Season with more salt and/or honey to taste. I usually make a double batch of this and keep it in the refrigerator—it lasts quite well. If the dressing separates, just bring it to room temperature and whisk it back up to combine. 1. Cut strawberries into slices. 2. Pick the leaves off the mint, wash them, and just before serving, chop them finely. 3. Fill a big salad bowl with the greens. Toss with dressing to your taste, add the mint and strawberries, toss once more, and serve immediately. I eat this salad with pears throughout the fall, so I toast trays-full of almonds at once, and make double batches of the dressing to store in the refrigerator. 1. Preheat the oven to 350 degrees. Toast the almonds for for 15-20 minutes, until fragrant and perfectly golden-brown inside. (Bite one in half to check!) Chop the nuts coarsely. 2. Core fruit and cut into slices. 3. Fill a big salad bowl with the greens. Toss with dressing to your taste, add the pear or peach slices. Toss once more, top with almonds, and serve immediately.